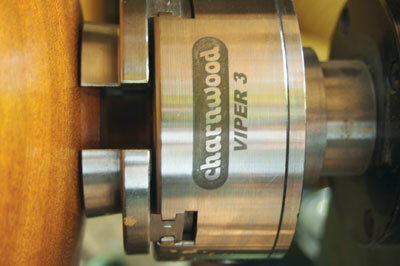 The Viper3 is the mid-sized version of the new Viper range of woodturning chucks from Charnwood. While generically classed as a 100mm chuck, it actually measures 95mm in diameter. It is compact, measuring only 65mm deep with the standard dovetail jaws fitted; in expansion mode these grip from 45-80mm and in compression mode from 67-32mm. The Viper3 is a solid, well-finished trade-rated self-centring chuck with two enclosed pinions adjusted with a 7mm square key. It has a removable back plate which can be replaced with an optional indexing plate if required. Both the jaws and the slide ways are clearly numbered and a small grub screw acts as a limiter to prevent the jaws being accidentally over-expanded. The Viper3 comes with jaw carriers, standard jaws, wood screw, chuck key and hex key for swapping jaws. 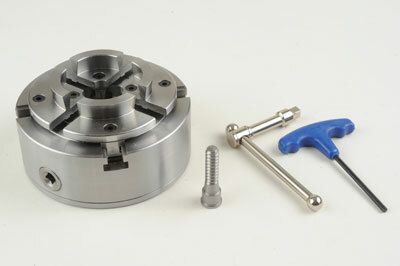 It has an M33 x 3.5tpi thread but 1in x 8 and 3â„4in x 16 inserts are available. The short mounting thread presents a known problem with Vicmarc, Oneway and Hegner lathes but bespoke spacers are readily available from Charnwood. With such a spacer in use, my Hegner readily and securely accepted the chuck, which proved to run surprisingly true and with little in the way of lateral movement of the jaw carriers in their slide ways. I used the chuck on a couple of projects, using both spigots and dovetails, and deliberately removed and replaced the work on a number of occasions - something I normally try to avoid - and found minimal misalignment. I did not use an insert but, given the accuracy of the rest of the machining, I don't envisage these throwing up any problems. To my mind the dovetails on the jaws are, at 12mm, too deep, and the optimum sizes a bit too small for a chuck of this size - but that is a personal view based on what I am used to using. In all other respects the chuck was a joy to use; the pinions have a nice feel to them, the torque is taken up evenly, and the grip is firm and strong. I will readily admit to being pleasantly surprised at the quality of this Far East-sourced chuck. No, it is not as accurate as some significantly more expensive chucks but, on the other hand, it is at least on a par with others - well-known names - that cost more. It begs the question, to what extent should you pay a premium for quality that will often not be required or appreciated. For the typical turner this chuck and its wide range of reasonably priced jaw sets will prove more than adequate and represents excellent value for money.